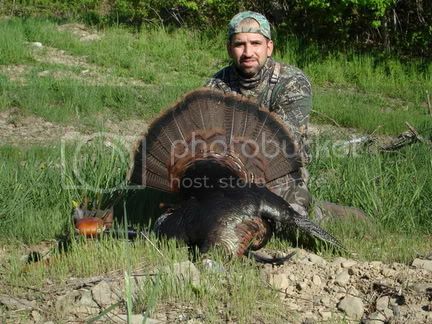 This was one of three gobblers I came to know pretty well this season.See "Trainwreck and a bully hen" and "Prettyboy is no more" for the full story of taking this bird.I missed the same bird a week ealier......Redemtion!!! He was taken with "Old Reliable" my 56" 62@28 Kempf Kwyk Styk.A 600 gr. 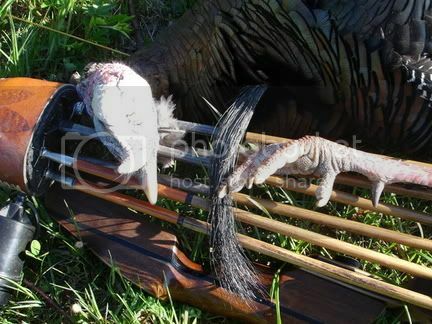 cedar I made myself,160 Snuffer broadhead.I also used a Double Bull Pro Staff blind.Shot was about 20yds,and the recovery was a handfull(low hit),because I had just missed the gobbler he was with.So,I didn't have my string tracker attached.